If you think all of Sydney's water comes from Warragamba Dam, H20 2U will make you think again. This exhibition tells the story of the diverse catchments and big and small dams on Sydney's doorstep which supply our drinking water. 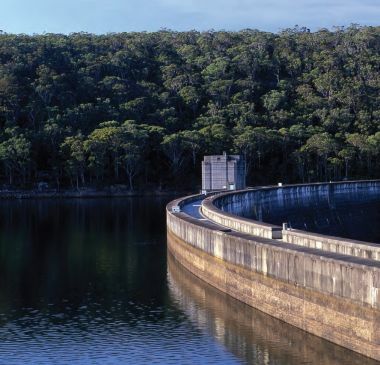 A network of rivers, weirs, canals and pipelines connect 21 dams that supply water to more than 4.5 million people across Sydney and the Blue Mountains, Illawarra, Southern Highlands, Shoalhaven and Goulburn regions. Completed in 1888, Prospect Reservoir, around 35 kilometres west of the Sydney CBD, has been an important part of Sydney's water supply network for more than 120 years. 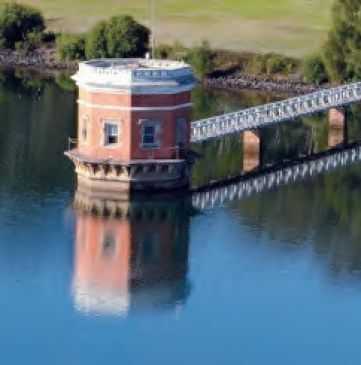 Before the Prospect Water Filtration Plant opened in 1996, water from Warragamba Dam and from the Upper Nepean dams to Sydney's south was diverted into the reservoir to supply Sydney. Today water is transferred directly into the water filtration plant and only excess water is diverted into the reservoir. 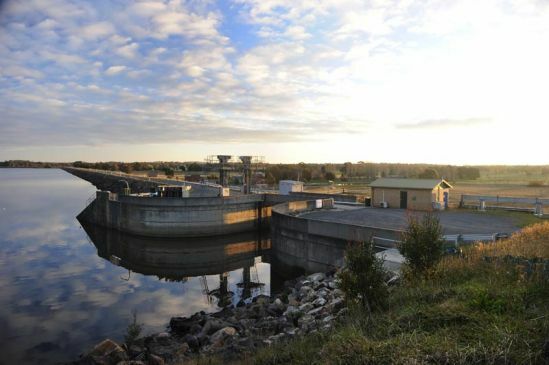 Prospect Reservoir remains an important part of our water supply network and it can now serve as a vital backup supply if water from the other dams is unexpectedly interrupted or if pipelines require maintenance. A raw water pumping station at Prospect, commissioned in 2007, allows around 30 billion litres of water to be directly accessed from the reservoir. That's enough water to supply Sydney for at least three weeks. 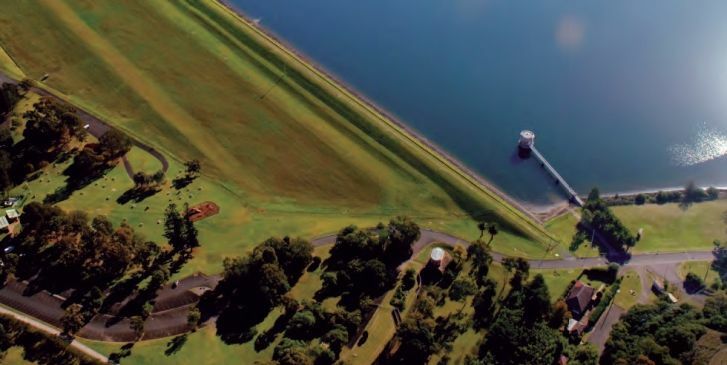 Prospect Reservoir is Australia's oldest earthfill embankment dam. 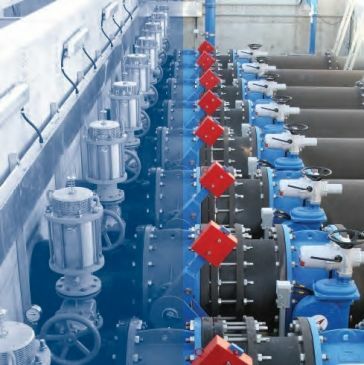 To access water in the reservoir, the raw water pumping station uses eight underwater pumps and one standby pump. They are among the largest pumps of their type in the world. The water filtration plant at Prospect can treat water directly from Prospect Reservoir if required. Visiting Prospect Reservoir has been a favourite for family picnics for more than 50 years and remains popular today. It is open daily from 7am to 4.30pm (6am to 6.30pm during daylight saving time). Cupping your hands helps you picture a drinking water catchment. A catchment is an area where water is collected by the natural landscape. Gravity causes all rain and run-off water to eventually flow down into a creek, river, lake, ocean or seep into the groundwater system. In some catchments, dams are built across rivers to capture and store water for drinking or other purposes. Using the best science and technical advice, WaterNSW manages the drinking water catchment area, called the declared catchment. This supplies drinking water for 5 million people living in Sydney, Blue Mountains, Illawarra, Southern Highlands and the Shoalhaven. 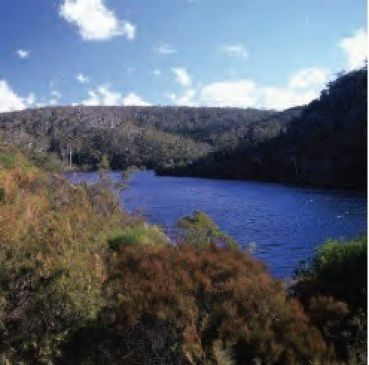 The declared catchment has five sub catchments which together cover 16,000 square kilometres and extends from the headwaters of the Coxs River north of Lithgow to the Shoalhaven River south of Braidwood. Good water quality relies on healthy catchments. Water quality can be affected by natural changes in the catchment as well as urban, rural and industrial development and activities. Rain falling in Sydney doesn't necessarily mean an increase in dam levels. The rain needs to fall in the drinking water catchments to flow into our dams. Sydney's drinking water catchments are home to 120,000 people and include more than 485,000 hectares of productive agricultural land that is essential to the NSW economy. The declared catchment covers only 2 per cent of the land area of NSW but supplies water to 60 per cent of the state's population. 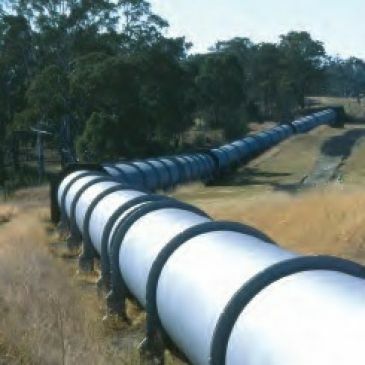 The Warragamba Pipeline transfers water from Warragamba Dam to Prospect Water Filtration Plant. Cordeaux dam is one of four dams on the Illawarra Plateau south of Sydney. 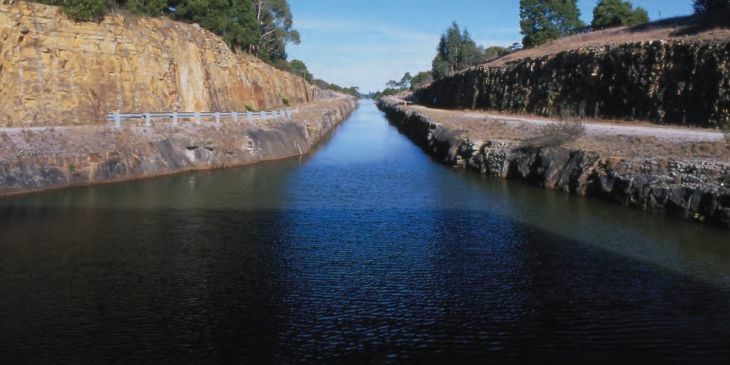 Glenquarry Cut allows water to flow from Wingecarribee Reservoir to flow to Nepean Dam. WaterNSW manages a network of 21 storage dams in the Greater Sydney region, which hold almost 2.6 million megalitres of water. 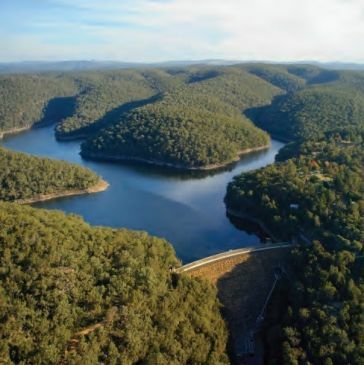 These dams are interconnected by a system of rivers, weirs, canals and pipelines, and supply water to more than 4.5 million people across Sydney, Blue Mountains, Illawarra, Southern Highlands and the Shoalhaven. The locations of the dams were chosen using scientific information which showed where in the catchment rainfall and runoff were most common. Today, WaterNSW manages the dams and protects the declared catchments to supply high quality raw water to customers, including Sydney Water and a number of local councils. Because of our variable climate, greater Sydney stores more water per person than most other cities in the world. Water samples are regularly taken and analysed from the rivers and storages to ensure that water quality is good. Water is taken from different dams at different times to balance the system. 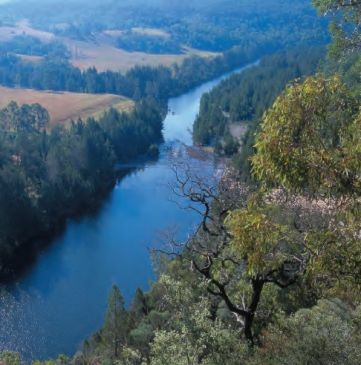 The Upper Nepean catchment south of Sydney is in the zone of highest annual rainfall on the mid New South Wales coast. Its catchments include Cataract, Cordeaux, Avon and Nepean rivers, which are tributaries of the Upper Hawkesbury-Nepean River. It is also home to the Cataract, Cordeaux, Avon and Nepean dams. The building of these dams (between 1907 and 1935) came as a result of two Royal Commissions – after the drought of 1901-1902 brought Sydney perilously close to complete water famine. They form part of the innovative Upper Nepean system which diverts water from Cataract, Cordeaux, Avon and Nepean dams to Prospect Water Filtration Plant via 64 kilometres of tunnels, canals and aqueducts (collectively known as the Upper Canal). It also supplies water to the Macarthur and Illawarra regions and to the Wollondilly Shire. All the Upper Nepean dams are mass gravity dams, which means the enormous mass of their walls is what keeps them in place. During its construction (1902-1907), Cataract Dam was the biggest engineering project in Australia, and the fourth biggest in the world. Famed Australian poet Banjo Patterson wrote a comic ballad "The Dam that Keele Built" about the politics behind the construction of Cataract Dam. 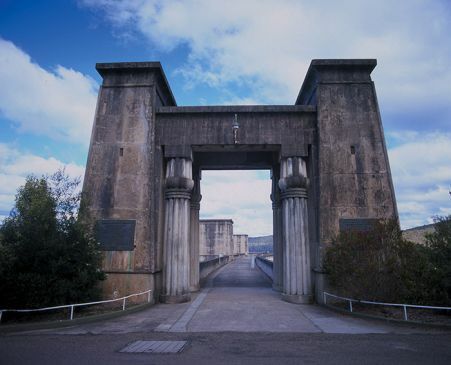 The architecture of Cordeaux Dam, built in 1918-1926, reflects the popularity of everything Egyptian following the discovery of Tutankhamen's tomb in 1922. Torpedo nets were placed in the Upper Nepean dams to protect them from air attacks during World War II. 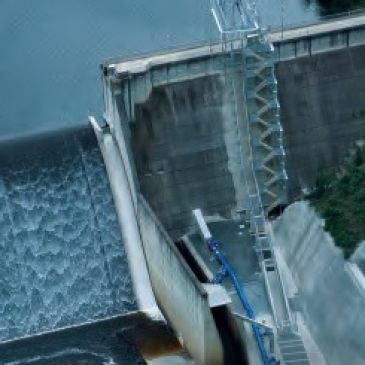 Woronora Dam supplies water to residents of the Sutherland Shire in Sydney's south, and to the northern suburbs of Wollongong. Construction of the dam began in 1927, across a 100 metre deep sandstone gorge on the Woronora River. It was completed in 1941 at a cost of about $13 million. Some of the cottages used by workers during the construction of the dam are still on the site, while the rest of the original Woronora township site is now a popular picnic and recreational area. Woronora Dam is a mass gravity dam, which means it remains in position under its own weight. Many of the men who worked on Woronora Dam also worked on the Nepean and Warragamba Dam projects. Work was suspended on the dam for four years during the Great Depression of the 1930s, forcing workers to look elsewhere for employment until the project started again. The building of Woronora Dam became part of the backdrop for the 1940s comedy drama "Dad Rudd MP" directed by Ken G. Hall. The film employed workers and their families as extras. 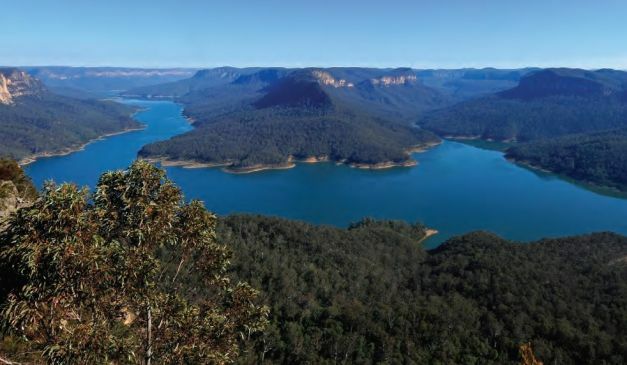 Six dams are located in the three areas which make up the Blue Mountains catchment. The construction of these dams spanned many years - from the construction of Middle Cascade Dam in 1905 to the building of Greaves Creek Dam in 1942. Together, these dams supply water to about 41,000 people from Mt Victoria to Springwood. Water also comes from the Fish River Scheme, which starts at Oberon over the Great Dividing Range. The scheme includes a dam and a weir for raw water supply, as well as reservoirs and more than 236 kilometres of pipeline. Residents living between Mt Victoria and Medlow Bath depend solely on the Greaves Creek and Lake Medlow dams for their water supply. A time capsule is believed to be hidden in the centre line of the wall of Greaves Creek Dam - placed there by workers in 1941. Water collected in the Blue Mountains catchments shows naturally high levels of manganese and iron due to the chemical make up of the local sandstone. This is filtered before it reaches local residents. Lake Medlow Dam was the first thin arch high stress concrete dam built in NSW and is one of the thinnest dams in the world. The Shoalhaven Scheme, located in the Shoalhaven and the Southern Highlands of New South Wales, was built in the mid-1970s and plays a unique role in Sydney's water supply history. It was designed as a dual-purpose water transfer and hydro-electric power generation scheme. 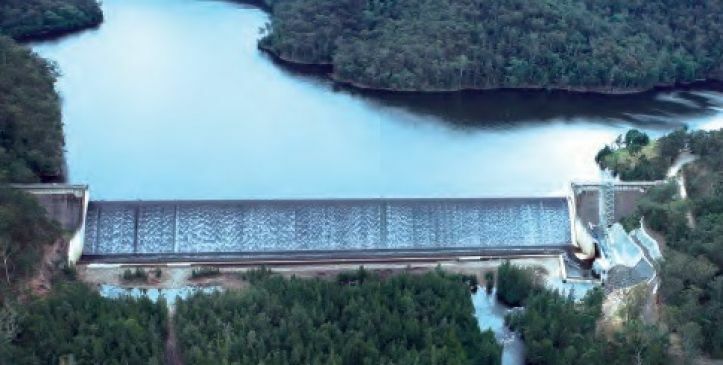 The centrepiece of the scheme is Tallowa Dam - a concrete dam located immediately downstream of where the Kangaroo and Shoalhaven rivers meet. It can hold as much as 90,000 megalitres of water and collects water from a 5,750 square kilometre catchment - extending from the Kangaroo Valley to Braidwood. 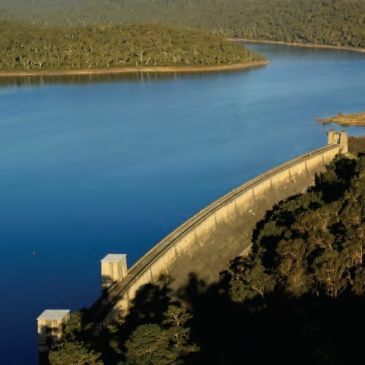 When dam levels drop to 75 per cent, water from the Shoalhaven Scheme can be fed into the Upper Nepean dams and Warragamba Dam to top up the Sydney and Illawarra water supply systems. These water supply transfers continue until the dams reach 80 percent. 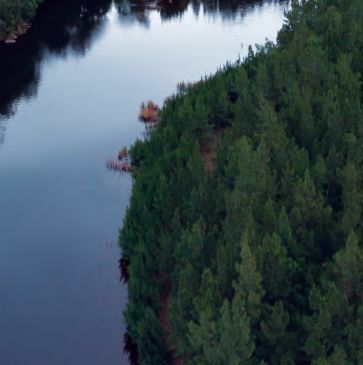 The Shoalhaven River is the longest river wholly within NSW. Flash floods and storms made building work on Tallowa Dam very difficult. During one flood in 1974, the Kangaroo River rose 5.25 metres in four hours. A fish lift at Tallowa Dam transports native fish, including the endangered Grayling, up and over the dam so they can migrate upstream. 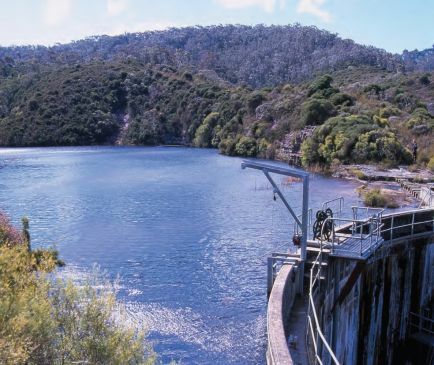 It is the largest fishlift of its kind fitted to an existing dam in Australia. The lift towers some 30 metres of track over the dam wall with a bucket carrying 2,500 litres of water. 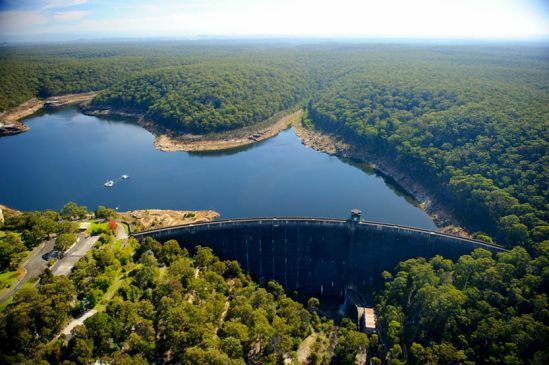 Located in the southern highlands of New South Wales, the Wingecarribee and Fitzroy Falls reservoirs are an important part of the Shoalhaven Scheme. 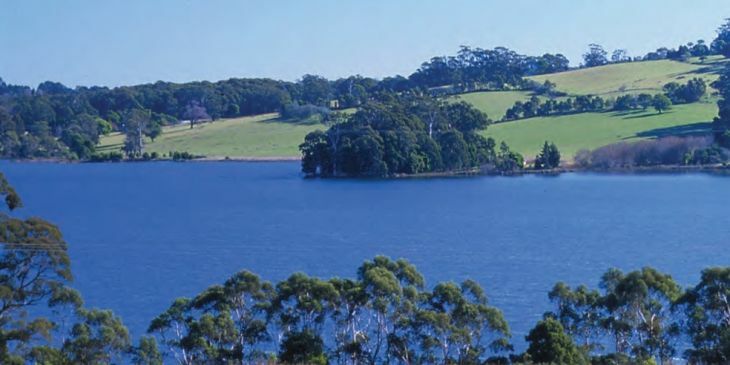 An earth and rockfill dam, Wingecarribee Reservoir is located on the Wingecarribee River about 15 kilometres south-east of Bowral. Fitzroy Falls Reservoir is located on Yarrunga Creek upstream of Fitzroy Falls - about 16 kilometres south-east of Moss Vale. It consists of four separate earth and rockfill embankments. Both facilities were completed in 1974. When required to supplement the Sydney and Illawarra supply systems, water from Tallowa Dam is pumped to Fitzroy Falls Reservoir. From there the water is transferred via a canal, pumping station, tunnel and a second canal to Wingecarribee Reservoir. From Wingecarribee Reservoir water can be released into the Wingecarribee River - which flows into the Wollondilly River and Lake Burragorang - feeding the main Sydney supply system via Warragamba Dam. Water can also be transferred to Nepean Dam and on to Sydney or transferred via the Nepean-Avon tunnel to Avon Dam to supply the Illawarra region. Goulburn can also be supplied with water from Wingecarribee Reservoir during drought. As well as supplementing water supplies for the Illawarra and Sydney regions, the Shoalhaven Scheme also supplies water to local communities. Wingecarribee Reservoir supplies Bowral and Mittagong via Wingecarribee Shire Council's water filtration plant, located next to the reservoir. Between September and March, the amount of water released down the Wingecarribee River to Warragamba Dam is limited to 400 megalitres a day. This is to protect platypus in the river during their breeding season. Fitzroy Falls Reservoir offers picnic facilities, barbeques and a children's playground and is open daily. Land-based fishing at Fitzroy Falls Reservoir is permitted from designated areas. A picnic area at Wingecarribee Reservoir offers picnic tables, drinking water and toilet facilities and is open daily.